I ha ve been a huge fan of BBQ Pizza for years and have struggled to find one I love that delivers. I have to say, my search is over – I have made my own and it is SUPER easy! There are a number of ways to shortcut and simplify this recipe, but I’m going to tell you exactly how I made it last night and leave it up to you as to what parts you may or may not switch out! I highly recommend using a pizza stone to cook with (I’m adding a link to purchase an inexpensive one at Amazon.com at the end of the post). I’ve only recently purchased one and will never make pizza without it again! Preheat oven to 425 degrees. Lightly flour the pizza stone with whatever type of flour you have on hand, I use Whole Wheat Flour. Form the Trader Joe’s dough carefully to fit the pizza stone. Allow to rise for 15 minutes, and then re-work the dough to fully fit the stone if it didn’t before. Let rise for an additional 15 minutes if you have time, or just begin adding the toppings. (If you’re not using a pizza stone, you’ll need to prebake the dough to prevent it from being too soft in the center) I smoothed a thin layer of the barbeque sauce over the dough. Then I lightly sprinkled the shredded mozzarella cheese over the pizza. I then added a couple handfuls of the chicken (hand shredded). Then add the sliced onions. Then sprinkle a small handful of mozzarella over the pizza. Cook in oven until the cheese just begins to golden. Remove from onion and cut using pizza cutter. Serve and Enjoy! This has instantly become one of my favorite dinners! Let me know if you try it and if your family likes it as much as ours!!! Yum! 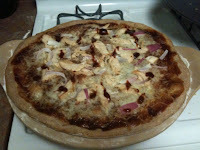 Love BBQ chicken pizza. Thanks for posting! This looks awesome - I will definitely try this and let you know how it goes! I love BBQ chicken pizza. This may have to get made next week! BBQ chicken pizza is the best. This recipe looks great. I LOVE cilantro..and that will be my only addition to this recipe. Thanks!